from Georges Trubert's Breviary in Provence, France, 1480. 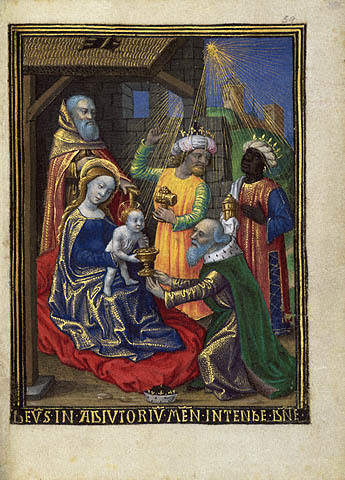 The Adoration of the Magi has come to be given a range of interpretations, both in the Magi themselves and in the gifts they offered. In traditional iconography, and in most Western artwork of the era, the Three Wise Men are depicted as a beardless youth, a vibrant man with a medium-length beard, and an old man with a long beard. This symbolized the adoration offered to God by all ages and generations. As the world became more aware of its ethnic diversity, the Magi were rendered as representatives of the "three continents of the world," or the three branches of Noah's descendants: Africa (Hamites), Asia (Semites), and Europe (Japhethites). Their gifts, too, had been seen as figurative of Christ. The gold represented Christ's status as a king. The franckincense represented His Divinity, since incense was offered to gods. (Many saints were martyred for withholding from Caesar their pinch of incense.) Myrrh was used in ancient burial practices, symbolizing that Christ had been born to die upon the Cross. In Byzantine iconography, this fact is represented by showing the Infant Christ wrapped, not in swaddling clothes, but in mummified bandages. Some think that the men who came from the East to the Lord when He was born in the flesh and who adored Him by offering gifts did by no means understand in those same gifts the noblest mysteries which Holy Church now sublimely understands -- namely: in gold, a king; in incense, a God; in myrrh, a human being Who would in due course die and be buried -- but that they were bringing mysteries greater than they knew, and each simply offered as a gift to Him Whom they had come to adore as king the most valued product of His country. But if we diligently ponder their own words, we ascertain it to have been far otherwise; for this is what they said when they were coming into Jerusalem: "Where is He Who has been born King of the Jews? For we have observed His star in the East and have come to adore Him" (St. Matt. 2:2). Surely it is apparent that they understood Him to be a human being, for they say: "Where is He Who has been born?" And it is apparent that they also understood him also to be a human being, because they declare it in the same saying. And it is apparent that they also believed Him to be God, whence they add afterwards: "And we have come to adore Him." For such learned men would not have come so far to worship one whom they believed to be merely a human being and a king, and not God as well. They also had this lofty and noble perception about Him: namely, that although He was King of the Jews, He was also willing to save the Gentiles who were willing to believe in Him and to come to Him. They proved this especially by their own coming, and by their action. from "On Eight Questions," Bede: A Biblical Miscellany. W. Trent Foley and Arthur G. Holder, trans. (Liverpool: Liverpool University Press, 1999), p. 149.